Each quarter, when Harry Kraemer '79 finished teaching his popular Managerial Leadership course, students would tell him, "You ought to write a book about this stuff!" Kraemer would smile but shrug the suggestion off — until Samir Gokhale '09 convinced him otherwise. Gokhale sat through Kraemer's class with a tape recorder in hand, transcribed the audio-notes and handed Kraemer a 200-page draft which, he believed, could serve as the basis of a book. "Samir literally didn't take 'no' for an answer," recalls Kraemer, a clinical professor of management and strategy at the Kellogg School. "So I thought, 'This time, I've got to take it seriously.'" "The four principles of values-based leadership are not solely for CEOs, managers, or leaders who have many people reporting to them. The principles apply to anyone who wants to improve his or her personal leadership. Whether you manage 10,000 people, 10 people, or one person, or you are a single contributor influencing a team, you are on a leadership journey. Even if you have no one reporting to you, there are ways you can make a difference and have a positive impact on others. Using your ability to influence others to do what you think needs to be done is what true leadership is about." With further editing and honing, those notes turned into Kraemer's new book, From Values to Action: The Four Principles of Values-Based Leadership (fromvaluestoaction.com). The book articulates the values that create responsible leaders and values-driven organizations. 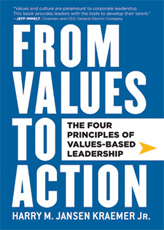 From Values to Action focuses on Kraemer's oft-cited "Four Principles of Leadership," which include self-reflection, balance, self-confidence and humility. When developed properly within an organization's leadership, Kraemer asserts, these four principles can drive many facets of a company, from human resources to communication to socially responsible leadership. "Sometimes leading and running an organization, whether it's 20 people or 20,000 people, can seem overwhelming," Kraemer says. "But if a leader has his or her act together and these four principles in place, then the organizational part of this is pretty straightforward." Kraemer certainly knows organizations. He spent 25 years — including five years as CEO — at Deerfield, Ill.-based Baxter International, and he now serves as executive partner of Madison Dearborn, a Chicago-based private equity firm. At Kellogg, Kraemer occasionally comes across a real-life example of the values he advocates for. One such example is the One Acre Fund, an organization founded by Andrew Youn '06 that aids African farmers. Impressed by Youn's mission, Kraemer has pledged the proceeds of From Values to Action to the One Acre Fund. "I got into this values discussion not just to talk about values, but to bring up examples of people and organizations who seemed to have the 'values' piece just right," Kraemer says. "The fact that this book benefits the One Acre Fund completes the whole circle: Andrew and his team are a great example of what values-based leadership is all about."